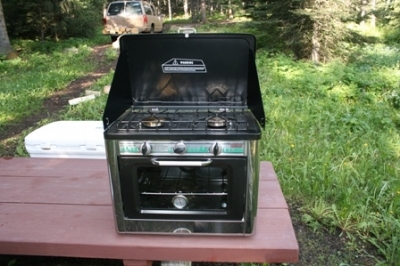 Montana Test.com - Results for: Camp Chef Outdoor Camp Oven 2 Burner Range and Stove! Tested and Reviewed! Outdoor Camp Oven 2 Burner Range and Stove. The Camp Chef’s Outdoor Oven was a hit on a five day four night camping trip in the Castle Mountains. This unique oven and twin burner cook stove impressed all our campers and testers. The oven has a glass oven door, with thermometer attached to an oven rack. You can view the increase in temperature and regulate as desired. The twin burners and oven are matchless with push button igniter. We used a five-foot bulk hose adaptor for fuel on a large bottle of propane. You can also use a small disposable propane tank. This portable oven puts out 3,500 BTU’s per hour and 5,300 per burner. The range is complete with windscreen and nonstick enamel cooking surface. Everyone enjoyed the oven, when the bacon or sausage was ready, we put in in the oven staying hot until the rest of our meal was ready to eat. The Camp Chef Outdoor Oven was a joy to test and it worked perfectly. You've always wanted an oven when camping - Now you can with the Outdoor Camp Oven. Don't let its compact size fool you. The Outdoor Camp Oven features over 14,000 total BTU's, the twin burners and spacious oven have plenty of power to get your cooking/baking done right. This stove's folding lid and carrying handles designed with portability in mind. This camp oven is loaded with features. It is just perfect for your cabin, summer camping, or RV. Inside Oven dimensions W 16" x H 10" x L 10"
5-foot disposable bottle regulator bulk tank hose adapter. For use with all appliances using disposable bottle regulators. Perfect for attaching your MVP Sport Grill to a bulk tank. Can be used with any disposable bottle appliance.